The Google search console (Webmaster Tool) is a great web utility which is being used for improving the search ranking performance of any website or blog. If you are publishing content online in multiple languages or for various locations/regions, then hreflang tag is helpful for you to drive more organic traffic. If you came across the error message "Your site has no hreflang tags" shown in the Google Search Console while analyzing the search performance of your website or blog and want to fix it then you are at the right page. The Google crawler handles the hreflang tags if you added in your website to match the visitor's language choice according to your defined language in hreflang tag. 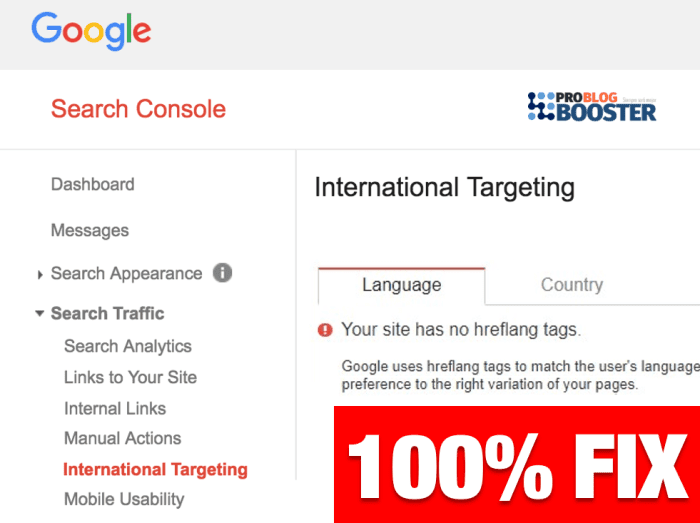 This hreflang tag is nothing but language tag helps you from an SEO perspective to crawl international targeting in google webmaster and also that tells the Google and other search engines about the language of your website or blog. So hreflang tag is a way to mark your pages which are similar in nature but specifically aimed for different regions and/or languages. As a result of this, the owner of the multilingual site/blog expects search engines to send people to the content in their own language. Say a user is French and the page that ranks is English, but there’s also a French version. You would want Google to show the French page in the search results for that French user, and for many other multilingual users as well. According to the hreflang tag you added, the Google and other search engines serve the suitable language or regional URL in SERP (Search results). The hreflang tags are fairly commonly used to target different markets that use the same language – for example, to differentiate between the US and the UK etc. Adding hreflang tag in your WordPress/Blogger/Website HTML is very easy and simple. If you are new to the hreflang tag then the following short introduction will definitely help you not only to add it in your blog but to fix any hreflang tag error in search console. So what makes us think of hreflang tag? Does it really beneficial from SEO point of view? Google's search console suggests that you should add an hreflang tag to your website so that the Google and other search engines can use your language tag to provide search results accordingly to the visitor's searching for a particular language or geodetic location you specified. One: If your page is optimized in accordance with user's language and region, then you can expect your viewers to land on that after using hreflang tag. Thus in order to get the higher ranking, you have to reduce your bounce back rate. And this bounce rate can only be reduced if you make your site multilingual. Two: Prevents Google to treat the content as a Duplicate. With the help of hreflang tag, you make yourself clear to Google search engine that the content is almost the same but just optimized for different people. However, sometimes users could not able to set up their site/ blog in this way which facilitates the content for multilingual readers. And as a result of this, such users faced this error "Your site has no hreflang tags.". Here you can able to fix the errors in hreflang tags as it was created due to missing of supported language tags like ‘en-us’ return tags. Just follow below step which helps you resolve "Your site has no hreflang tags" error. Navigate yourself to HTML code of your site/ blog. Enter the following hreflang code under <head> section of your HTML. Save changes and allow Google to crowl your site, usually it takes 24-48 hours, but have patience. You may use such language codes in your hreflang tag while your content is to be read by Multilingual people. However, it's a good practice to make use of the canonical version of URL so that, relative URL will get used in hreflang tag. The canonical URL is already given in above code. I’m sure above given solution will help you resolve the error. If you are still facing this error or something you want to suggest apart from above information, feel free to use below comment section to get in touch with me anytime. Happy to hear from you and to implement the suggestions for helping others.